Maurizio Sarri insists Napoli have a long way to go in their pursuit of a first Serie A title since 1989-90, despite topping the table. Maurizio Sarri believes Serie A leaders Napoli require more than 90 points to dethrone reigning champions Juventus and win the Scudetto this season. Napoli stayed three points clear at the top with a 3-1 win at home to Sassuolo on Sunday. Sarri's high-flying entertainers are yet to lose this season, winning 10 of their opening 11 matches, while scoring 32 goals and conceding just eight times. But Sarri insists Napoli have a long way to go in their pursuit of a first Serie A title since 1989-90. "Right now, the forecast is a bit improbable. I don't think the top teams can continue to keep this pace," Sarri said. "Many smaller team will get new players or they will find their game. Going forward the games will be different, harder. This pace is destined to slow down, not just for us but for any team looking to win the title. "The feeling though is that we will need to have more than 90 points to win the championship." 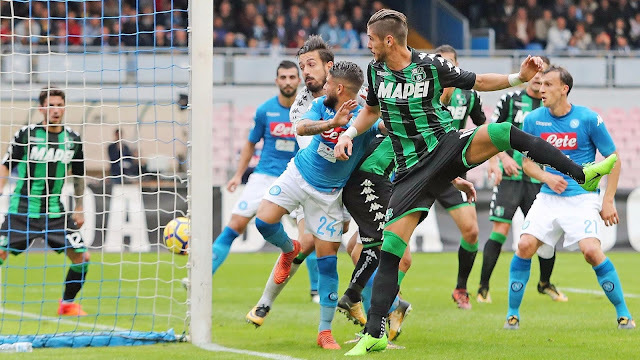 Napoli will again test themselves against one of Europe's elite during the week – Manchester City, having suffered a 2-1 defeat in the highly-anticipated Champions League clash on October 17. In the aftermath of that defeat and Napoli's goalless draw with Inter, Sarri said he felt as though his side care more about Serie A. Following the weekend's victory over Sassuolo, Sarri added: "Thinking of the Champions League as an obstacle would be unfair. The Champions League is the world's biggest competition for clubs and we're proud for being part of it. That's why we need to play with great determination. "It's obvious though that we're going to think about where we can be more competitive and we're going to put our energy in that. That's a danger that can happen even if you don't want to. Playing against Man City will not be easy, but it will also be great. Right now, City are the best team in Europe."